The U. S. Geological Survey (USGS) was asked to conduct an initial, independent evaluation of the science needs that would inform the Administration’s consideration of the right places and the right ways in which to develop oil and gas resources in the Arctic Outer Continental Shelf (OCS), particularly focused on the Beaufort and Chukchi Seas. Oil and gas potential is significant in Arctic Alaska. Beyond petroleum potential, this region supports unique fish and wildlife resources and ecosystems, and indigenous people who rely on these resources for subsistence. This report summarizes key existing scientific information and provides initial guidance of what new and (or) continued research could inform decision making. This report is presented in a series of topical chapters and various appendixes each written by a subset of the USGS OCS Team based on their areas of expertise. Three chapters (Chapters 2, 3, and 4) provide foundational information on geology; ecology and subsistence; and climate settings important to understanding the conditions pertinent to development in the Arctic OCS. These chapters are followed by three chapters that examine the scientific understanding, science gaps, and science sufficiency questions regarding oil-spill risk, response, and impact (Chapter 5), marine mammals and anthropogenic noise (Chapter 6), and cumulative impacts (Chapter 7). Lessons learned from the 1989 Exxon Valdez Oil Spill are included to identify valuable “pre-positioned” science and scientific approaches to improved response and reduced uncertainty in damage assessment and restoration efforts (appendix D). An appendix on Structured Decision Making (appendix C) is included to illustrate the value of such tools that go beyond, but incorporate, science in looking at what can/should be done about policy and implementation of Arctic development. The report provides a series of findings and recommendations for consideration developed during the independent examination of science gaps and sufficiency. These recommendations are important for understanding what the USGS discovered in the course of this study and to help inform and improve decision making. 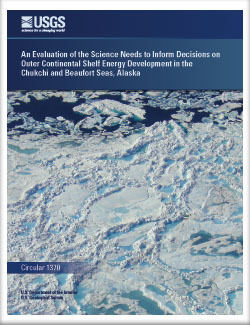 Holland-Bartels, Leslie, and Pierce, Brenda, eds., 2011, An evaluation of the science needs to inform decisions on Outer Continental Shelf energy development in the Chukchi and Beaufort Seas, Alaska: U.S. Geological Survey Circular 1370, 278 p.